Screaming 60’s? | So Many Exciting and Beautiful Places! This is the term given to the gale force winds that are not unusual in this latitude. Fortunately, it didn’t apply today, and even the Captain is surprised at how calm the seas are. We are cruising to Palmer Station in Antarctica, with the expectation of arriving tomorrow morning around 4:30 am. I probably won’t wake up for that. It’s a sea day, so we’ve been attending some lectures and classes. There are some very good speakers on board: General Michael Hayden, former head of CIA and of NSA, and the highest-ranking intelligence officer in the armed forces, who spoke a few times about issues of national security; Rob Caskie who told stories about early expeditions to find the South Pole; Martin Frost former US Representative from Texas, former DCCC Chair, and chair of the House Democratic Caucus, Ken Rees, former Controller of News and Current Affairs for HTV television in the UK; Tony Leon, former Ambassador from South Africa to Argentina; Robert Schrire, South Africa political analyst based at the University of Cape Town; and Marc Ginsberg, former US Ambassador to Morocco. I took a beginning Spanish class today so I would know more that the basics (por favor, gracias and baños.) It was a very good class, Berlitz style, and my brain was hurting by the end of the hour. I just hope I can remember some of it tomorrow. Mi hombre es Kathleen. Mi espousal es Mark. Yo soy de Los Estados Unidas. We have another formal night, and I’m kind of getting sick of wearing a long gown (can’t believe I would ever say that,) and I know Mark is getting tired of the tux. No one said beauty was easy. Again, the seas are remarkably calm. We can’t believe our luck. Our ship picked up several scientists from Palmer Research Station at about 8am. 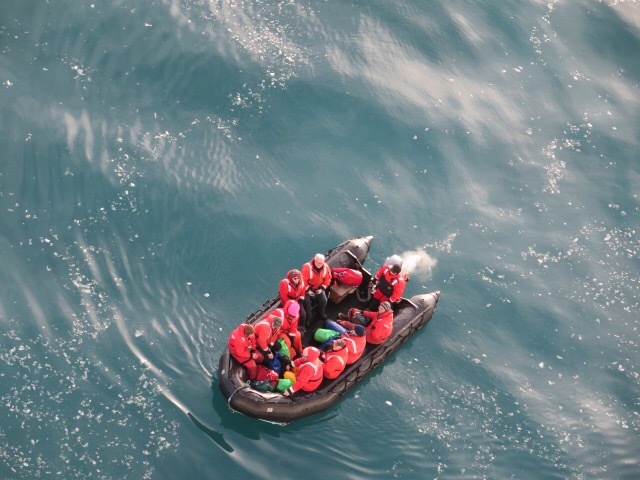 Two Zodiacs brought them to our ship. They look so small, yet move so very fast in these cold waters. Each one carried 10 people. 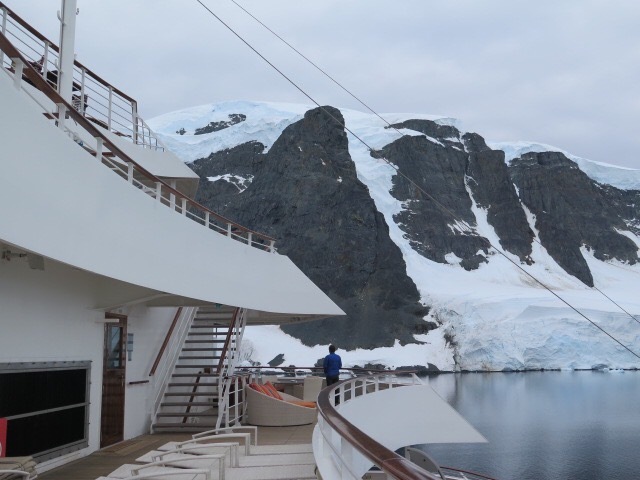 While waiting for the Palmer Research team to reach and board our ship, we gawked at the glaciers, the ice bergs, the mountains, the seals, whales and penguins. It was a gorgeous morning – something we did not expect. We enjoyed a presentation by Bob Farrell, station manager at Palmer Station, and Randy Jones, lab manager. The Palmer Station, located on Anvers Island, is one of 3 permanent stations that the US maintains in Antarctica. 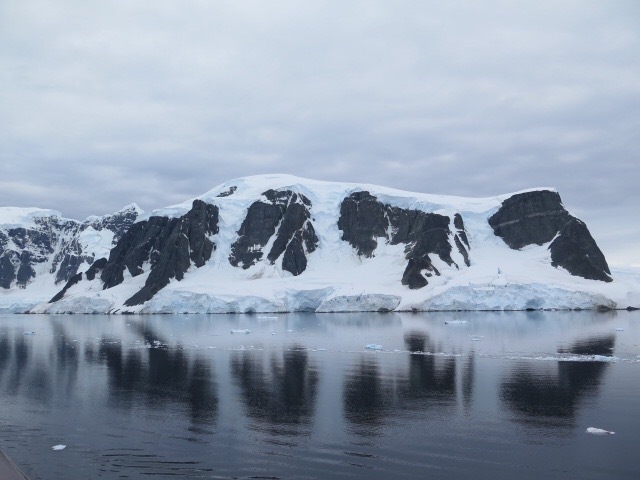 Research by the United States Antarctic Program is funded by the National Science Foundation, and includes research for fundamental knowledge of the Antarctic Continent, research on Antarctica’s role in global systems, and research using Antarctica as a platform, i.e. climate. The Palmer Long Term Ecological Research Program is a member of the Long Term Ecological Research Network, funded by the National Science Foundation. Sea life is being studied for possible uses in the medical area, with promising data for the treatment of melanomas and other cancers. 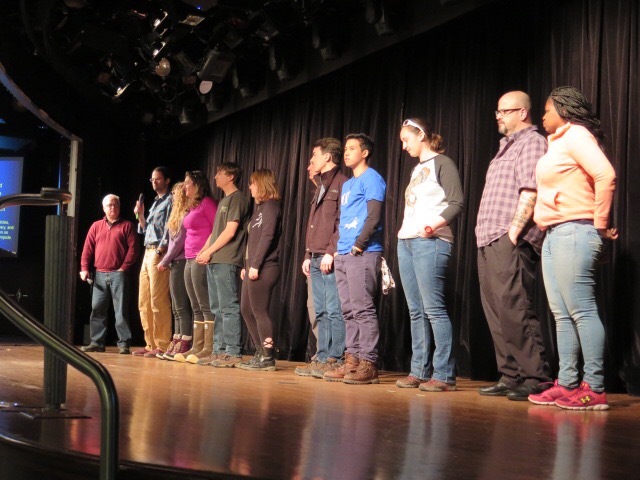 The maximum population at Palmer Station is 44, including 23 support staff, a physician and 20 scientists. There are two research ships. The station is powered by two redundant diesel generators, and has two redundant water systems. Everyone must pass a physical before going to the station. The on staff physician can perform minor surgeries, but if there is a medical emergency, it’s necessary to wait for a ship to take the patient to the mainland. There is no way to land an airplane at this station. Antarctica’s largest land animal is a wingless fly, the belgica antarctica, the southernmost insect in the world. 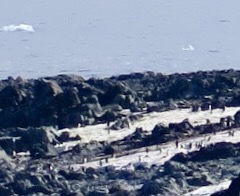 Penguins and sea lions are considered ocean animals. Changes have been observed in the penguin populations since the 70’s, with decreases in the Adele and increases in the Gentoo. This doesn’t mean that the Adele is endangered, but that it is moving to other locations. 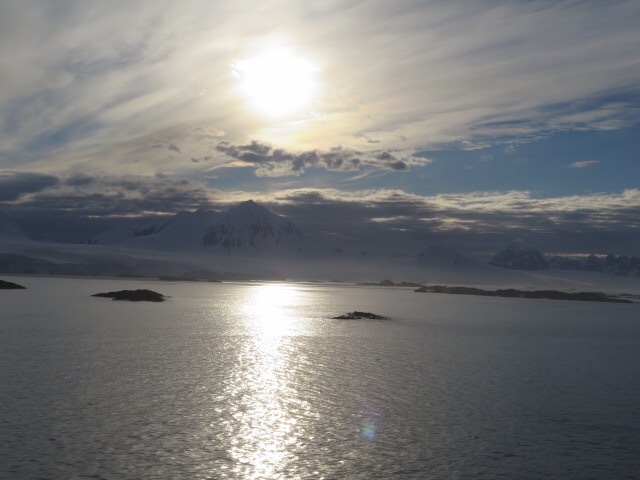 You can find more information, as well as a webcam, at the US Antarctic Program Portal. 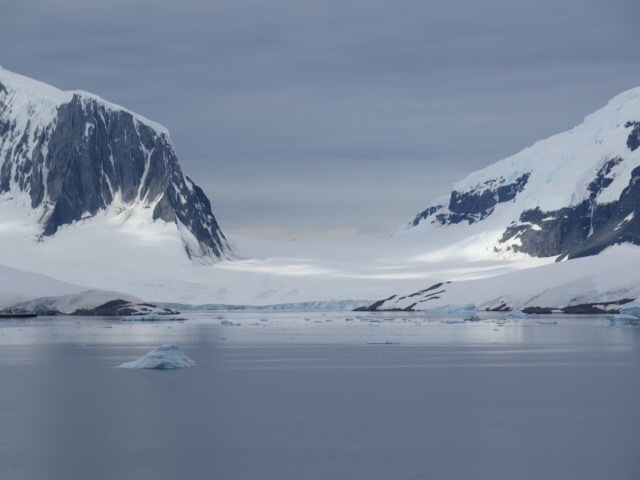 Antarctica is the fifth largest continent, covering 5.4 million square miles. (I don’t know how that compares to the newly discovered continent, mostly submerged, of Zealandia.) In spite of the fact that 98% of the continent is covered by ice averaging more than one mile in thickness, it is a desert with only about 8 inches of precipitation per year along the coast and less inland, although there are numerous lakes and rivers, and even a mountain range, under the ice. Recorded temperatures have reached almost 130 below fahrenheit. There is some vegetation and a few species of animal here (the largest being the fly I mentioned earlier.) About 1,000 – 5,000 scientists reside here during the year, at the 30 plus stations on the continent. 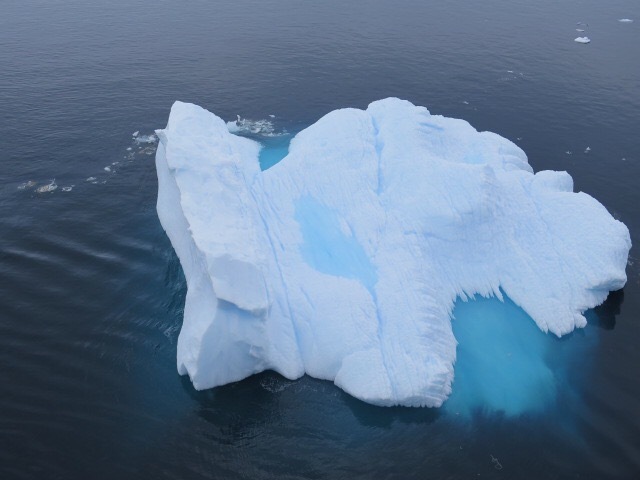 The weight of the ice has caused the continent to sink by .3 – .6 miles. The glaciers have been retreating over the past years. In the 1970’s, the glacier was just outside of Palmer Station, now it’s about a mile away. There are numerous lakes and rivers under the ice. The continent is covered with mountains as well, the highest being Mount Vinson at 16,066 feet. It appears these mountains are an extension of the Andes. The continent is a condominium, governed by the Atlantic Treaty System since December 1959. Among other things, the treaty provides that the continent shall be used for peaceful purposes only, that there will be freedom of scientific investigation, and that the results of that investigation shall be shared freely. No interference with nature. No fishing for food. All food must be brought in by ship, all garbage must be removed. Crystal sent a care package back with the Palmer crew, including 80 pounds of lamb as well as some fresh fruits and vegetables. While having lunch, we overheard at least one of the crew exclaiming about the mangoes – a real treat. 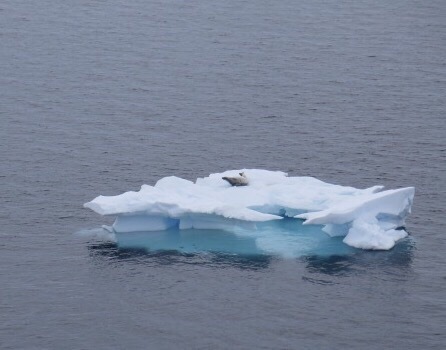 As we sailed back east and north past Anvers Island, we were treated to fabulous views of glaciers, mountains, icebergs, seals, and penguins. It was difficult to tear ourselves away from the unbelievable scenery. 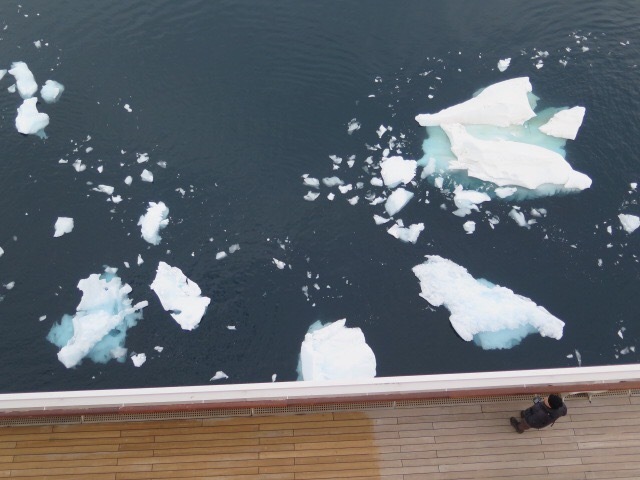 One of the staff on Crystal told us that this was even better than going through the Northwest Passage last summer. I won’t bore you with the 200 photos I took today, but will offer a sample. 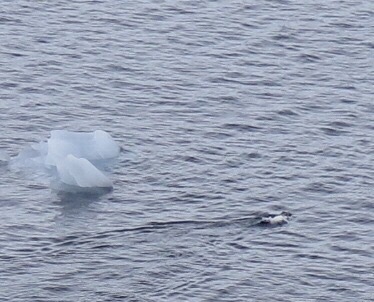 This entry was posted in Antarctica, Crystal Cruises and tagged Antarctica Research, Ice cap, icebergs, Penguins, seals, Southern Ocean, Zealandia. Bookmark the permalink. 1 Response to Screaming 60’s? Thank you for sharing your story. It was very engaging and I learned a lot. I came across it by accident. My son is one of the “buggers” at Palmer Station. I know you generous gift of “freshies” was greatly appreciated! Safe and fun travels!